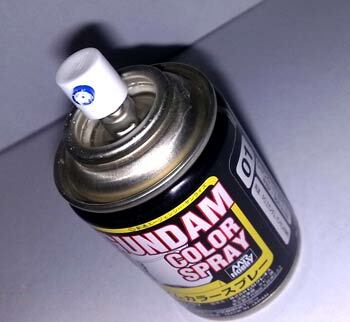 Been experimenting with those spray paints found in hardware stores that are usually used in commercial applications (cars, furniture, etc) for use in model kits as one modeller suggested this to me. My problem had been that my "remote" location meant that there were no hobby stores in my area to source modelling paints from. Well there was "the" one store but it had a very limited selection, (I could count in my one hand the available spray paint in their store). Also the price was very high since it was really a toy store and selling kits seemed to be just an experiment on their part to see whether it would take off or not. I was looking for a suitable paint that mimicked the qualities of Tamiya or GSI Creos spray paints. 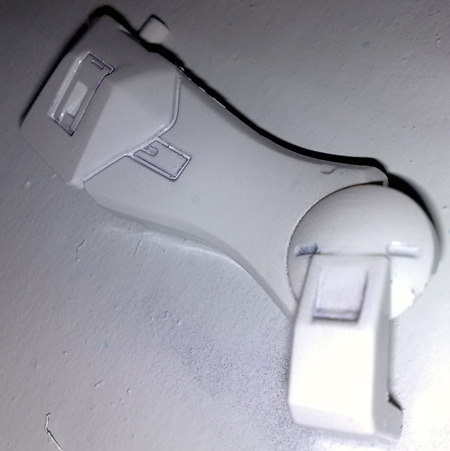 These qualities were that it had a fine spray and stuck easily to the plastic model allowing for a thin coat which wouldn't cover the panel lines and details and make the model appear thickly coated. 1. I did some test shots between a Gundam Spray paint from GSI Creos and the Pylox Lacquer spray paint from Nippon Paints. 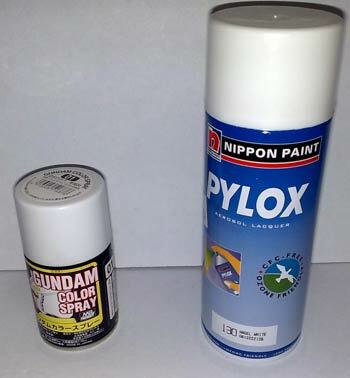 Comparing the two the Pylox can has a higher spray pressure and volume as well it being less fine than the Tamiya/GSI Creos paints. This results in the part being easily covered by the paint causing it to glob up and easily run through the panel lines and strip off the painted area. You can remedy this by adjusting the distance of the spray from the part (10 inches worked for me). 2. While rummaging through some online forums I found out that you can mimic the spray pattern of the Tamiya/GSI Creos spray can by using its spray head. True enough I was able to get the spray density to similar levels by using the spray head from the GSI Creos spray can I already had on hand. However the volume and pressure of the spray is still greater than the genuine modelling spray. 3. I experienced some paint stripping on certain paint colors, so it would be best to use a plastic primer prior to adding the coat of paint. 4. Painting by thin layers also seems to help. But it will really test your patience though as you wait for each coat to dry. Conclusion on this is that the Commercial lacquer spray paint that can bought at the hardware store will work as an alternative to the modelling spray paints. And that good results can be had by using the Future floor wax as a primer and the spray head from a modelling spray can. It will still come out slightly thicker than using a genuine modelling spray paint can. Given a choice, I would still prefer the original modelling spray can, but since I don't have one, this is definitely my best alternative. 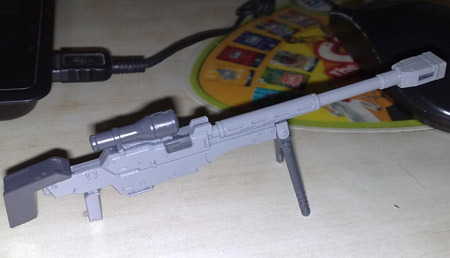 The picture below is the sniper rifle of the Bootleg Gundam Dynames I bought that I used as a test subject for these painting experiments. The Future had been added a week before spraying as a thin single coat. It came out nice despite it not using the spray head from the GSI Creos. It was painted with the can about 10 inches away from the part. Painted with a coat of Future and using the original spray head. The paint wasn't able to cover the colored panel lines completely leaving it visible. Painted with a coat of Future and using the spray head from a can of GSI Creos modelling spray paint. 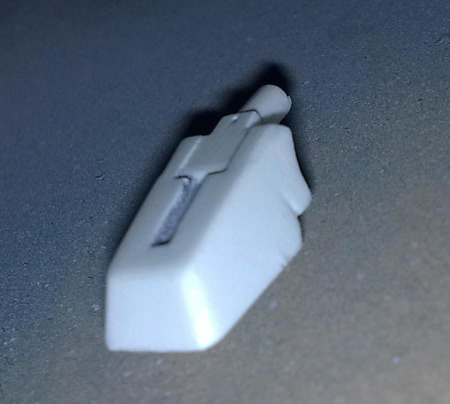 The surface was thinly coated, you can still see the painted panel lines as it wasn't covered completely. For more pictures, check out some Gundam kits I've painted with Pylox Lacquer spray : Rick Dias Master Grade and 1/100 Gundam Kyrios. These kits were painted first with a plastic primer, then the nozzle of the Pylox can was switched with the spray head of a GSI Creos spray can for a better mist pattern.